…which is what I did in 1986, London/ New York courting Meredith. Yesterday that phrase took on an entirely different meaning…. We live in a rectory or presbytère, next to a disused church. This statue has been our neighbor for 25 years. Our Ladies pose for a photo! 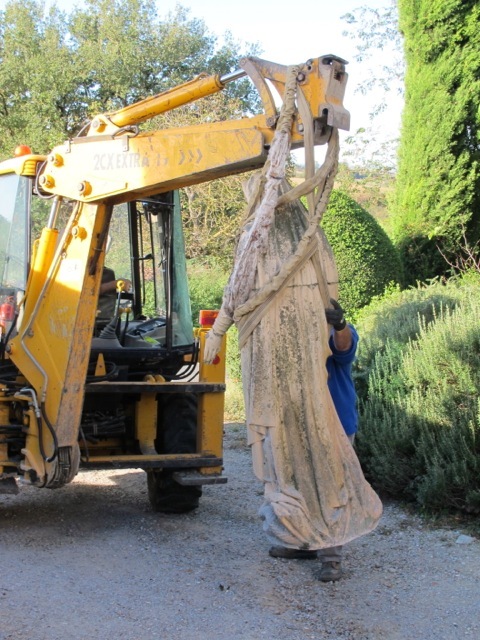 Yesterday our Lady took FLIGHT–albeit assisted–to the cemetery hard by. Short flights can be stressful–even when you know you are in safe hands…. 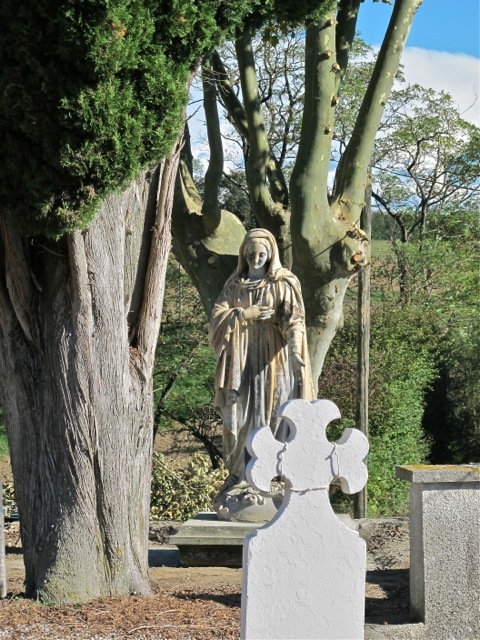 Now she presides majestically over generations of Dauzatois–permanent residents of the graveyard. Occasionally a new grave is dug, a visible sign that these quiet souls will soon be joined by a new arrival; more often the newcomer finds peace in one of the many family tombs. 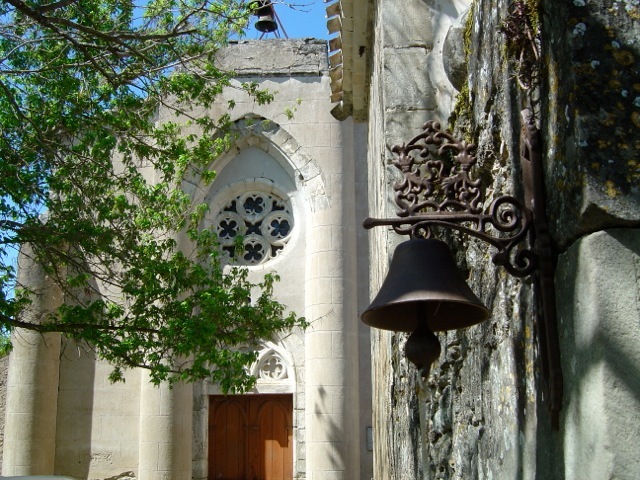 After decades beside the church door, an edict was issued from on high (the Mairie–owners of the church) that she was to fly again to her new perch. 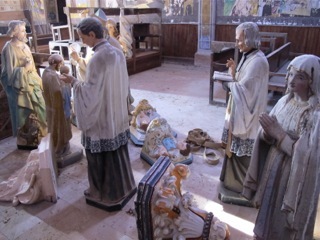 A couple of years ago the church was deconsecrated and stripped of its interior statuary. 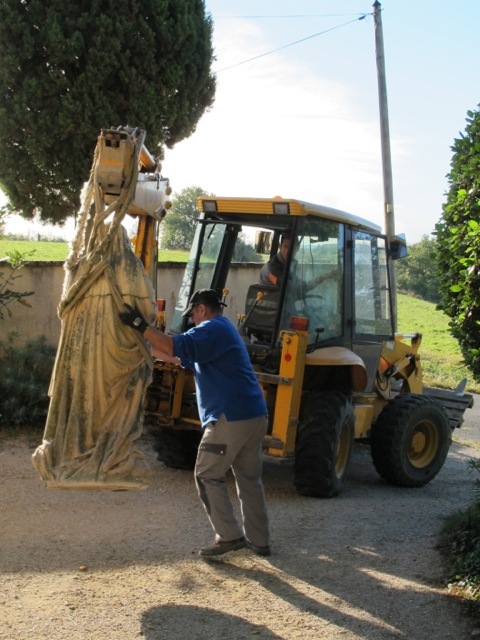 It was a curious site to see these iconic figures lifted off their pedestals, standing around in the middle of the empty church, like awkward guests at the start of a cocktail party–awaiting the arrival of the removal van. They’d known each other by sight for perhaps more than a century, shyly stealing glances from the safety of their niches–but never obliged to speak….Now they were face to face–no escape! 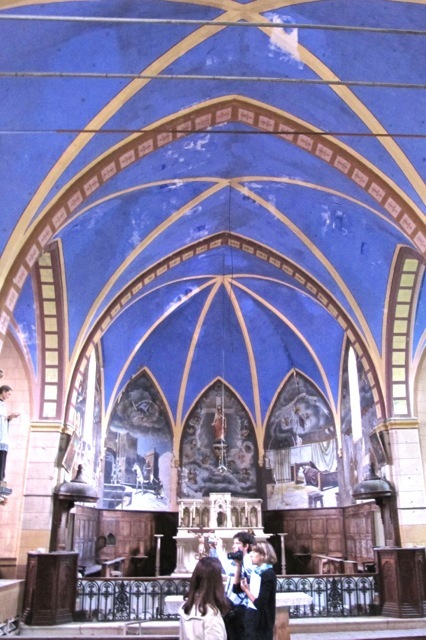 The wall murals tell the story of Saint Martin in primitive fashion and the vaulted ceiling is still a brilliant BLUE. 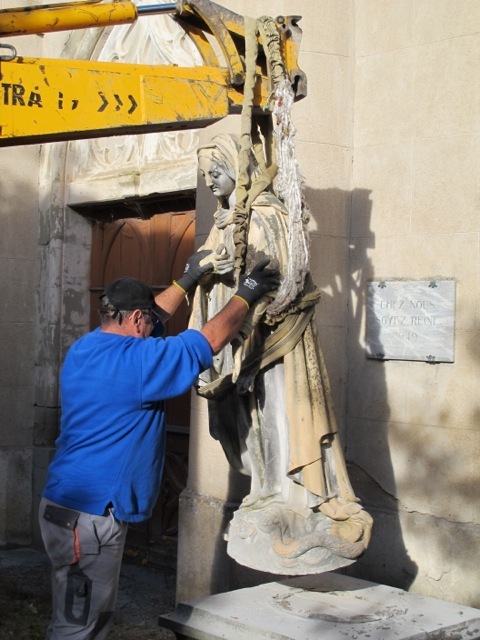 The demur figure of Mary has led a solitary life. 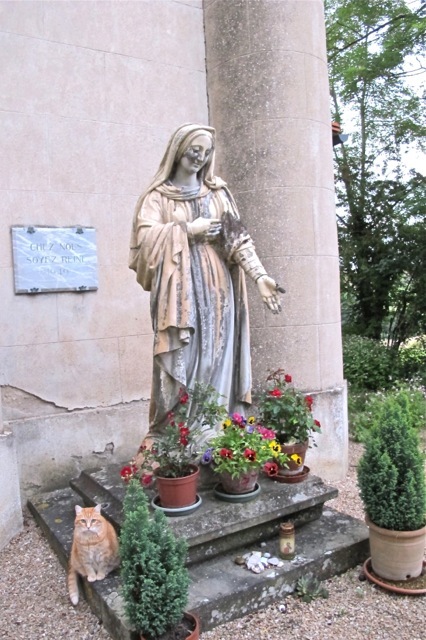 For years she’d stood at the end of the Curé’s garden–looking back at the church and the presbytère. 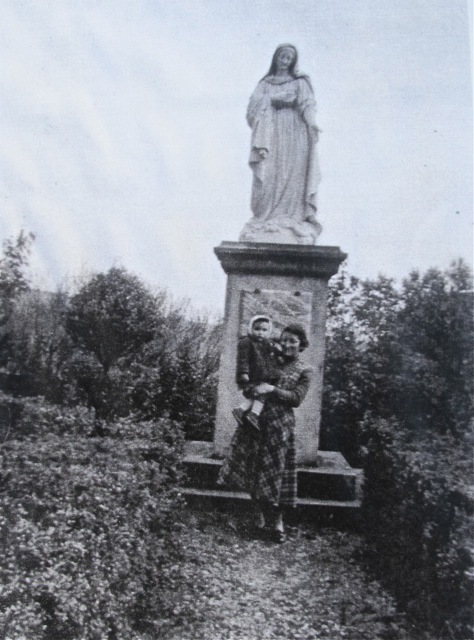 Parishioners with the statue in the garden about 60 years ago. 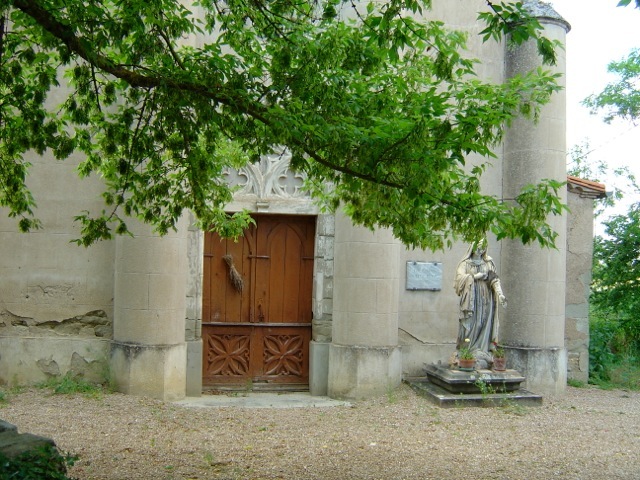 But then the previous owner of the house–feeling perhaps uncomfortable under the constant gaze of the Virgin Mary–decided it was more appropriate that she should stand vigil at the church door, welcoming the worshippers. So Monday wasn’t her virgin flight–pardon me–but maybe it was her last. a garden around which the live-in priest would walk while transposing his thoughts into sermons. a church to which a loyal, but dwindling group of adherents would come to worship. and a cemetery in which many of those worshippers are resting. Now she has time to reflect on all that and one might guess she’d be happy to be left in peace. Those still with us (living) seem very happy to be part of your blog! What lovely pictures and a very touching commentary. Thanks for sharing. Beatiful colours inside the church. Went to the Museum of Wales a couple of years ago and they have a very old church there with amazing colourful muriels on the walls. The Lady looks quite at home amongst the trees and memorials. It will be interesting to hear about the development of the church – if it happens! Life can be so poetic. such fine photos as well. Great and moving story. Thanks Maj-Britt–hope to see you soon. What a lovely post, is it me or does she look like she is smiling in her final place looking over the peaceful graveyard? 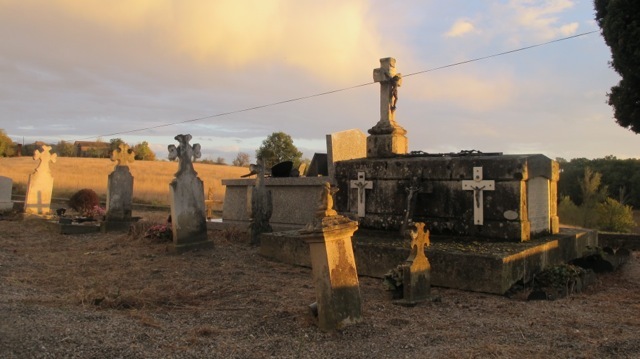 Your reports are always delightful – poetically written and often enhanced by photos – but this one was especially “moving.” It’s wonderful to hear about the goings-on in far-away France. What next? What happened to all the much later statues from inside? Have the murals remained? What a lovely story but I will miss seeing Our Lady upon opening the guest windows in the morning…her new surroundings do look very peaceful. They were apparently distributed round local churches. 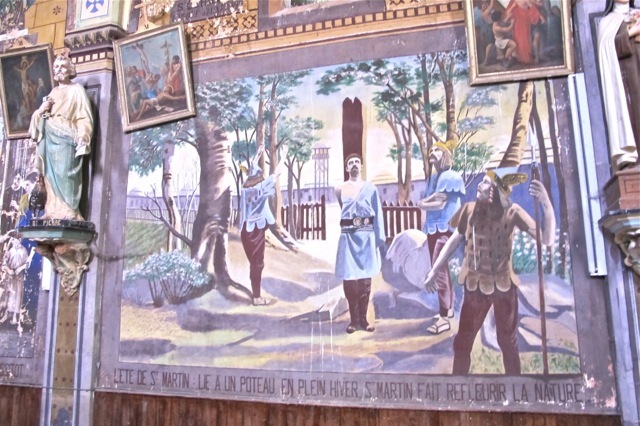 The murals remain. What a beautiful church! How sad it is no longer used. 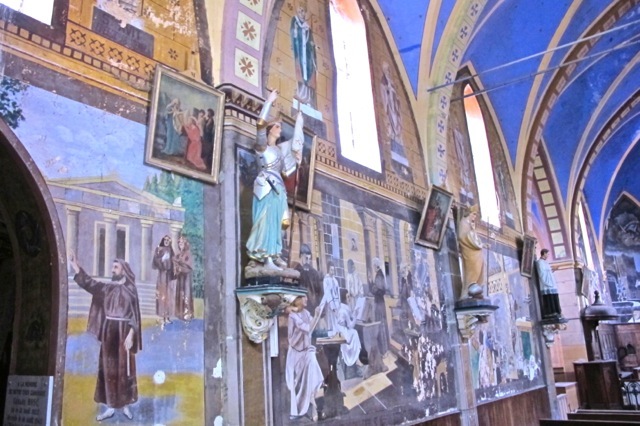 The murals look as if they were painted recently. Thanks to you they are now seen once again – and around the world to boot! 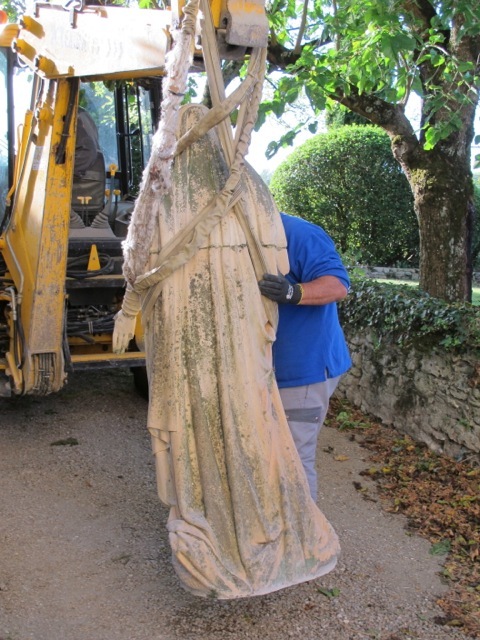 It was nice to see the Lady was moved to an appropriate spot and not stuck in some storeroom or cellar. Now she has some company at least.